A few weeks back I was at the garden centre and saw that they were selling praying mantis egg cases! 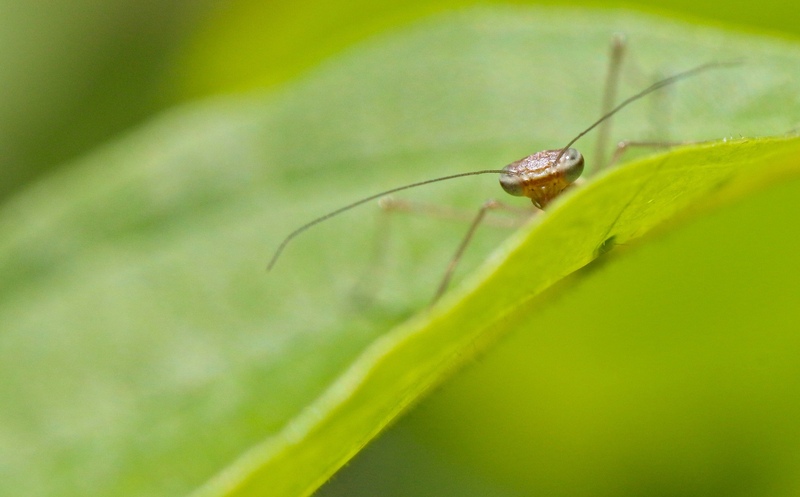 Praying mantises eat a lot of insects that can harm our flower and vegetable gardens, so the cases of eggs holding these little killers were for sale for the price of $15.00 to help control garden pests (plus they are really cute). Of course I bought one. 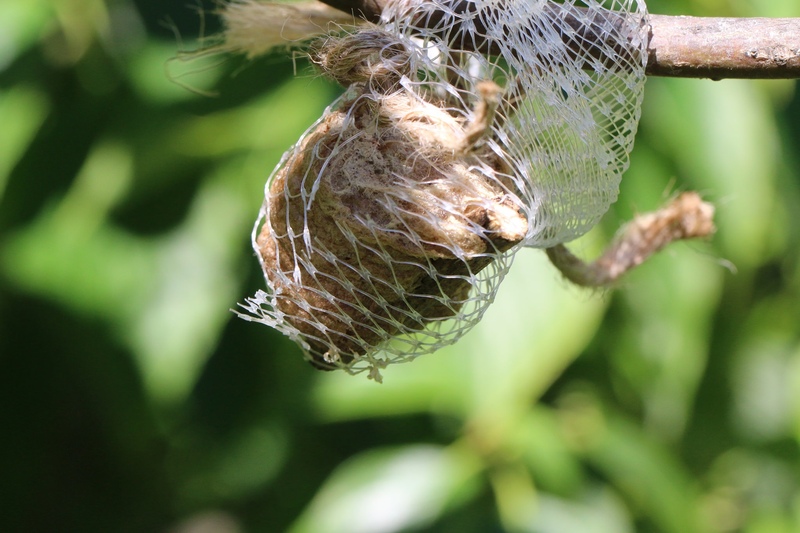 The egg case is made by the female in the fall, and starts out as a foam like substance that she deposits on a plant stem, such as goldenrod. When this foam dries, it provides a case in which the eggs can over winter. The case had been put in a mesh bag which I tied to a bush about 5 feet off the ground. The next step was to sit back and wait. The instructions said it would take one to eight weeks for the nymphs to emerge. What? Well, I tried to check every day, but really that is quite the range of time! Anyway, a couple of days ago I went to check the egg case and it was surrounded by tiny praying mantises! I saw 2 inside the bag, and the rest were hiding in the leaves of the pagoda dogwood I had tied the case to. I had about an hour to watch these little critters-they were really well camouflaged, and they could run very fast. They dispersed quickly. When disturbed, they would drop to the ground. Some of the praying mantis nymphs that hatched earlier were a bit bigger, and were waiting very still for the new babies to come out. This was not a welcoming party. They ate each other. No photos turned out of this, but here is one waiting. This cannibalism is not isolated to the nymphs. 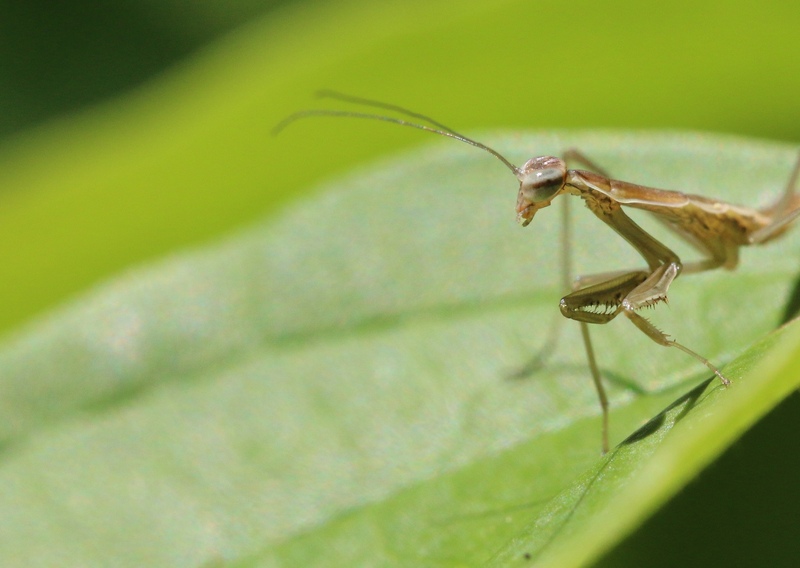 Did you know that the female praying mantis sometimes eats the male after, or even during, mating? Yum. It’s a tough world out there. 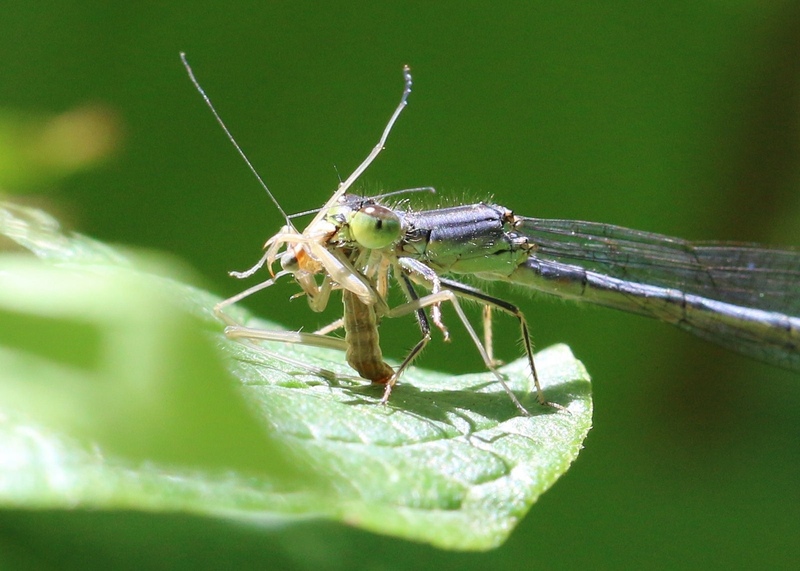 I got a close up view of a damselfly making a meal of one of my babies. Look out, little one! 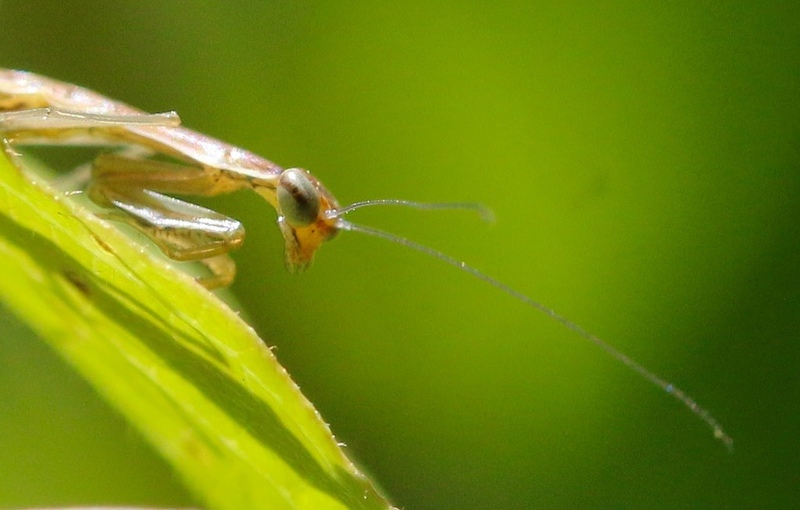 Praying mantises are unique in the insect world as they can turn their heads 180 degrees. 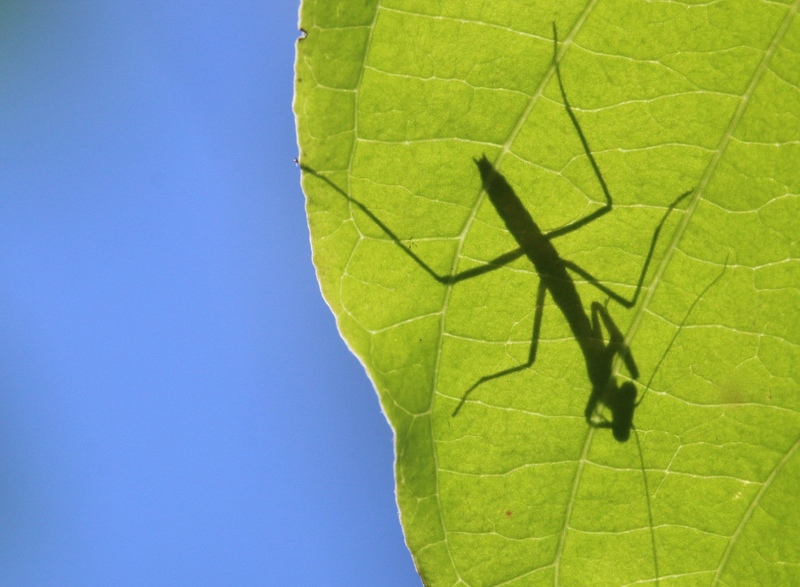 Try to sneak up on a praying mantis, and you may be startled when it looks over its shoulder at you. No other insect can do this. 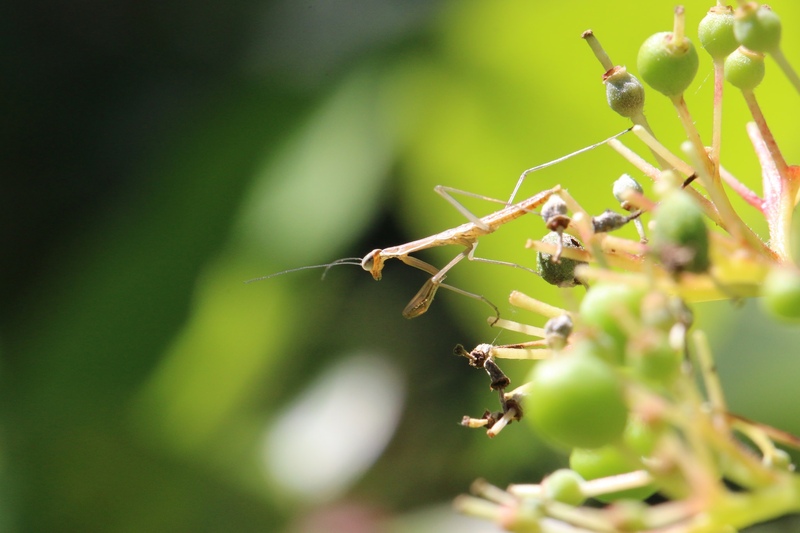 Praying mantids have a flexible joint between the head and prothorax that enables them to swivel their heads. This ability, along with their rather human faces and long, grasping forelegs, make them endearing in a creepy kind of way. 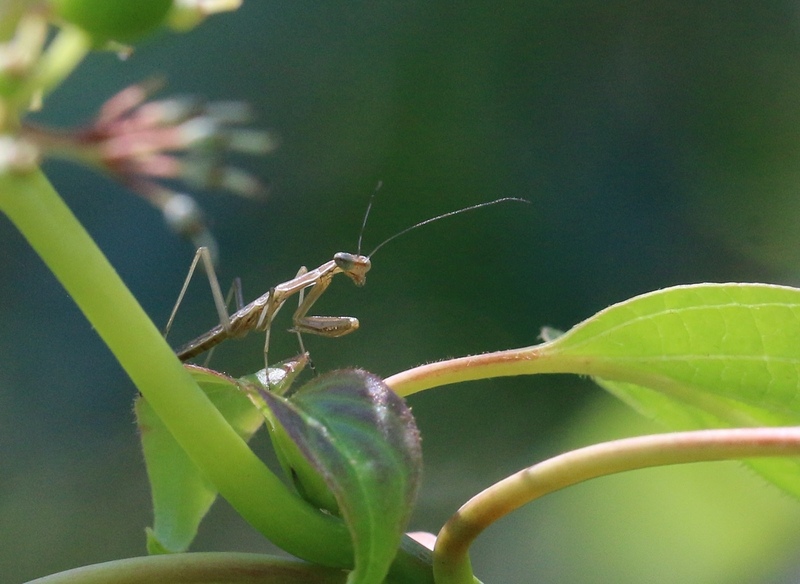 I don’t really know how many praying mantis nymphs emerged and ran off before I discovered it was their birthday, but I do know there have got to be some lurking out there in my garden. I hope I come across some of them as the summer and fall unfold. A master gardener I met last week told me that he and his wife just go out in the fall and collect praying mantis egg cases on goldenrod stems, and bring the stems back to their garden. Now that I know what the egg cases look like and where to find them, I plan on doing this too. Who knows, maybe I will have many generations of praying mantises living and reproducing in my garden. PS: Still waiting on the baby Bluebirds and Tree Swallows. baby, egg case, garden, insect, nymph, praying mantis, predator. Bookmark.